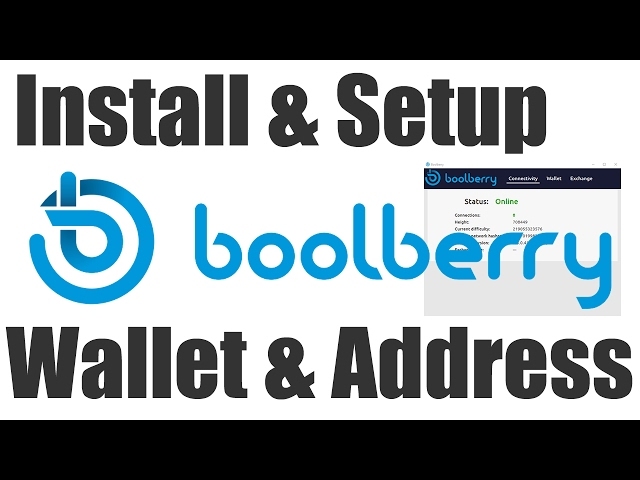 A video guide showing how to get started with the Boolberry wallet including installation, setup and address creation. 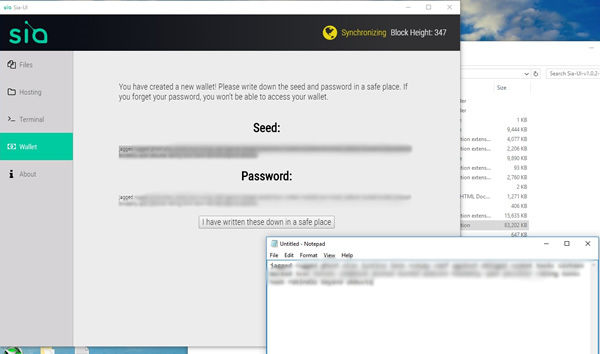 Also I’ve included how to add seed nodes to help get the wallet synchronized. I recently encounter this error within my Sia wallet, so I thought I would share the solution here and help others fix the problem. The problem can occur if the wallet or your computer crashes whilst being used and this then corrupts the sia data folders which cannot be automatically restored by the wallet itself. 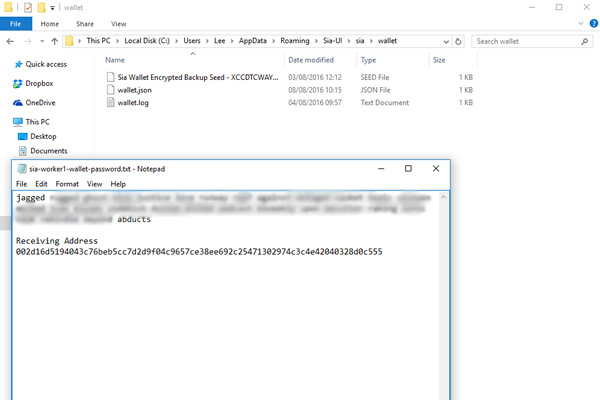 Find the local folder for the Sia blockchain and wallet data, it will be stored separately from where your launch the sia-ui.exe program. For windows users it will be saved like this. (Username will be your computers username). Appdata is a hidden folder and you may need to reveal it using the folders view options. Inside the sia folder delete all the folders except the wallet & consensus folder. After a delay the Siacoin wallet will load normally with your coins intact. Instructions for backing up the Siacoin wallet. There is no backup option within the Siacoin walle that allows for backup of your Siacoin wallet and without securing this important information your Siacoin could be lost forever in the event that something happens to your data. So it’s worth taking a few minutes to backup and secure your wallet as described below. Firstly Close the Siacoin wallet if is running. Create a New Folder on your computers desktop or another place of your choice. Call the folder Siacoin Wallet Backup. You should have a text file that you created when you first setup your wallet and it includes the wallet password, seed and a receiving address (if you setup using my guide). Copy this text file into your new Siacoin Backup folder. Next we need to backup the actual files used for your wallet and they are saved in a hidden place on your computer. The AppData folder is a hidden folder so you might need to change your viewing options to reveal the folder. Inside the Sia-UI folder you will see a folder called Wallet, copy this folder and it’s contents to the Siacoin backup folder you created. 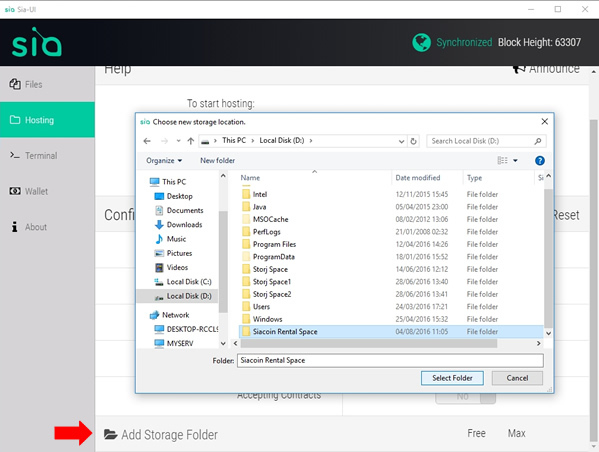 You can now save your Siacoin Wallet Backup folder to a place of your choice such as USB Drive or Cloud storage, however you should note that this folder is not secured and anyone with access could restore your wallet and gain access to your funds. 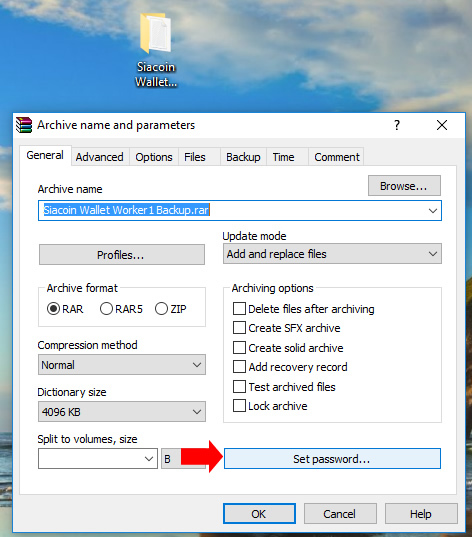 To secure my wallet backups I use WinRar which compresses the folder into a single file but it can also be used to password protect the files and cannot be un-compressed without the password. After setting the password, click ok to create your Siacoin Wallet Backup.rar file. Once completed you can keep the .rar file and delete the source folder. You now have a password protected Siacoin Wallet Backup. 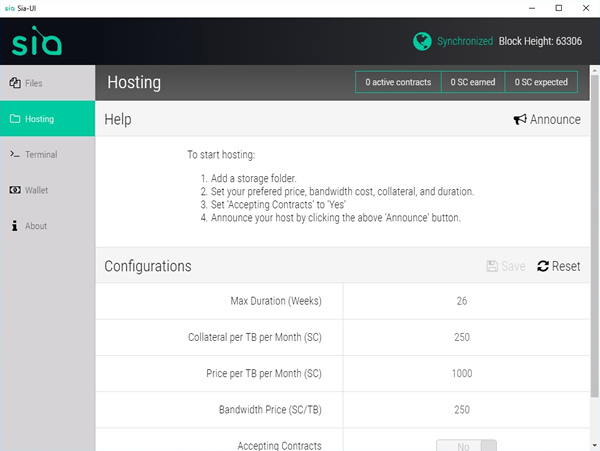 Once you have your wallet setup and synchronized, you need to fund the wallet with Siacoin before you can provide Hard Drive hosting on the network. You need to have at least 50,000 Siacoin in your wallet to provide hosting, however I would add a little extra to cover transaction fee’s, announcement fees & collateral. I funded my wallet with 55,000 which is about 0.05 Bitcoin / $29 USD at today’s exchange rates. Once your wallet is funded with the required Siacoin you can then setup the rental on your spare Hard Drive space. 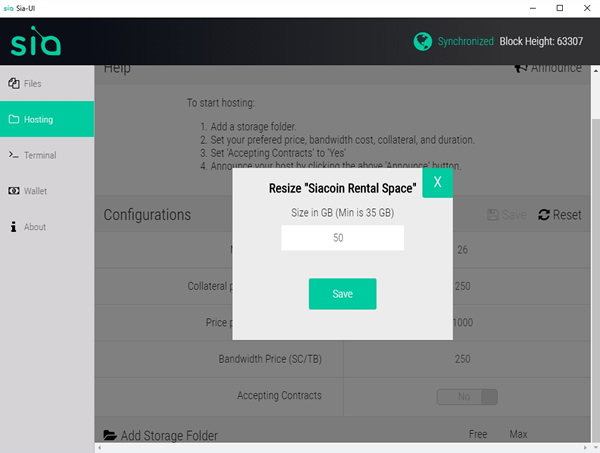 To rent out your space hard drive space (hosting) Click on the Hosting tab on the left side of the Siacoin wallet. In the main window at the bottom you need to select a Storage location and confirm how much space you wish to rent out. A new window will open and ask you to choose a storage location. I made a new folder on drive D:\ called Siacoin Rental Space and selected this as the storage location. You will then need to confirm how much space you want to provide for this rental contract, I set it 50GB and note that the minimum you can provide is 35GB. Click the save button. Then I got an Error! C:\Users\Lee\AppData\Roaming\Sia-UI\sia\host\storagemanager\03790881: A required privilege is not held by the client. But not to worry, I’ve seen this before! Reopen the Siacoin Wallet with Administrator Rights, once opened unlock your wallet and you’ll be able to create the hosting folder as described above normally. You should now have a folder setup and ready for hosting. We can now set the configuration options. 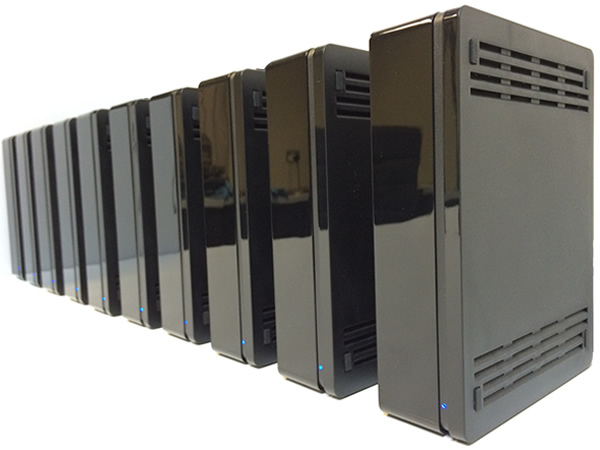 Max Duration (Weeks) – How long the hosting is provided to the renter. Collateral per TB per Month (SC) – If you lose the renters data you’ll pay this amount as compensation. Price per TB per Month (SC) – How much you want to charge per TB per month for your hard drive space. We have provided only 50GB in our example so we can earn 50 Siacoin per month. Bandwidth Price (SC/TB) – How much you want to charge for the internet usage used when a person downloads files from you. Accepting Contracts – Select Yes if you want to accept new contracts and provide hosting. If you make any changes to the default settings ensure you click Save button. If you wish to go back to the default settings click the Reset button. Here’s the settings I selected. With your settings selected & saved. 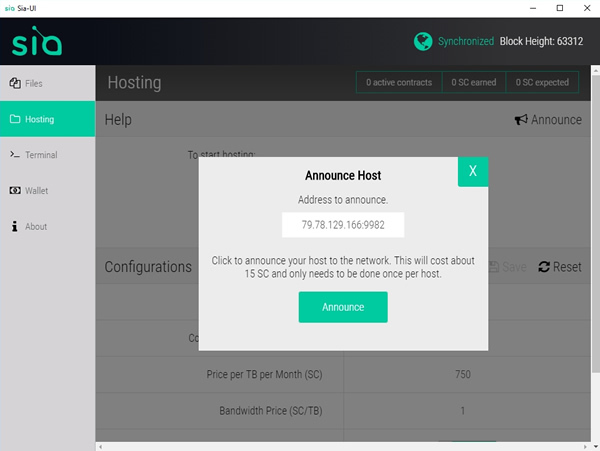 You can now Announce your hosting contract to the Siacoin network and let them know your ready to receive data. Click the Announce button on the top right of the window to Announce this contract. Leave your wallet Running & Unlocked. Over time you’ll see that you have some active contracts and by the end of the month you should have received your first Siacoins for the Hard Drive space you’ve rented out. Instructions on how to install, setup and use the basic functions of the Siacoin wallet. Extract the downloaded zip file to a folder of your choice. The downloads or Desktop folder for example. 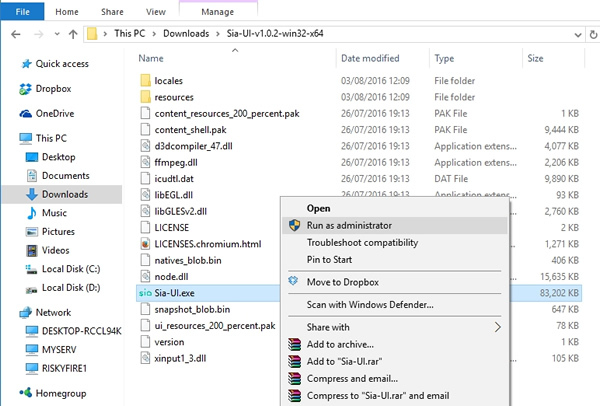 Run the Siacoin program called Sia_UI.exe from within the folder you extracted to. 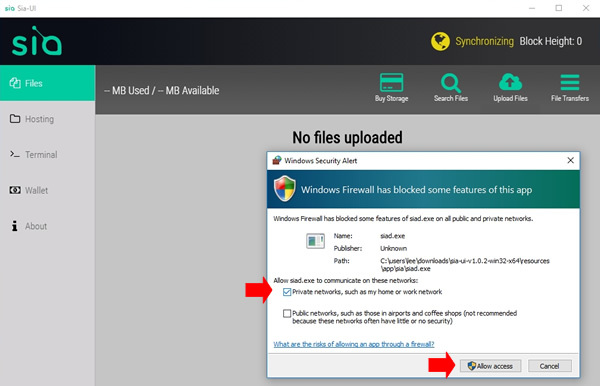 Tick the checkbox for allowing access to private networks and click the allow access button. The wallet will start downloading the Blockchain and synchronize with the Siacoin network. Write down the long password that has been automatically generated for your Siacoin wallet. 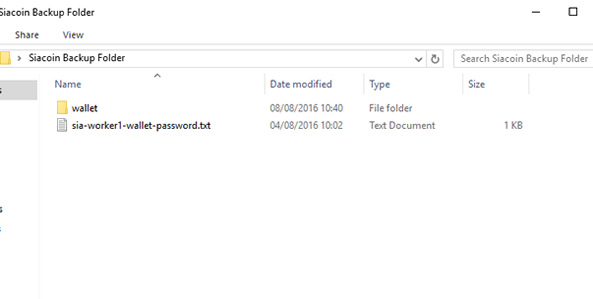 I copied & pasted the password into a notepad text document and saved it. Don’t forget this password! It cannot be recovered if its lost or forgotten. 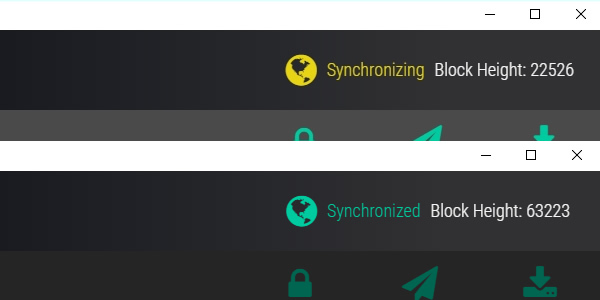 Wait for your wallet to be unlocked and the wallet to synchronize. Your wallet is now ready to receive and send Siacoin. Click the receive Siacoin button in the top right hand corner of the wallet to reveal your own siacoin wallet address. 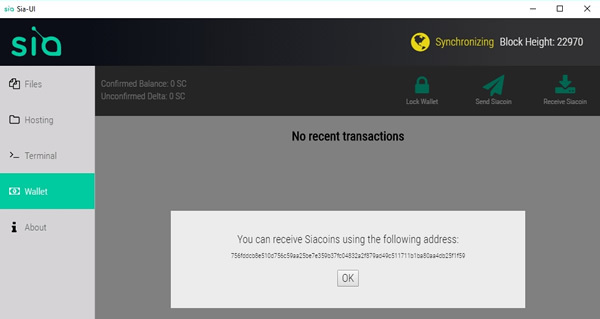 Use the address displayed in your wallet to receive Siacoins. To receive coins into your wallet you need to provide your friend / exchange / whoever with your siacoin address and they can send siacoin to you using the address you have provided. Use can also use this address as a receiving address for mining software or mining pool payouts. 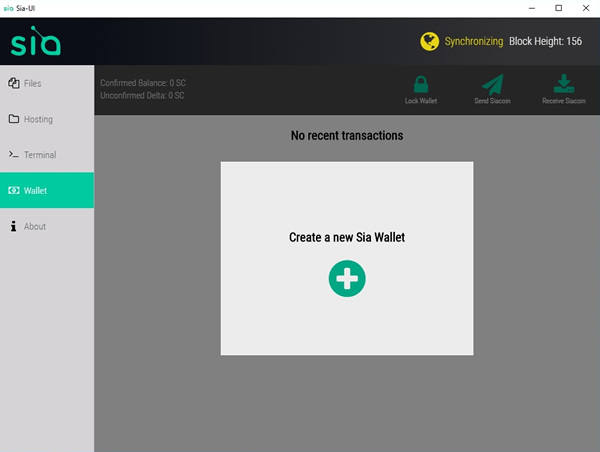 Hopefully you’ve now received your first Siacoins and have a Confirmed Balance as shown in the top left hand corner of the wallet. To send Siacoin to another person you will need their Siacoin wallet address, once you have their address click the Send Siacoin button from within the wallet program. Enter the amount of Siacoin you want to send & the address you want to send it to. Use the shortcut keys ctrl + C to copy the address and ctrl + V to paste the address. 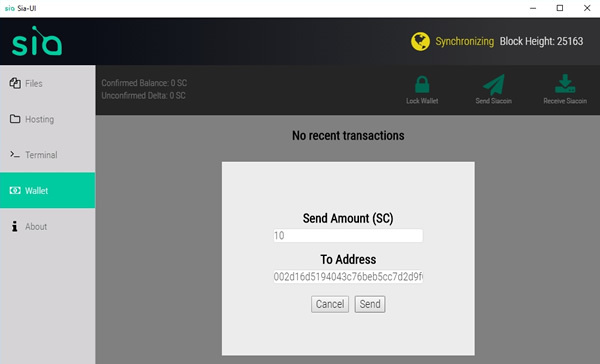 After clicking send your transaction will be sent to the network to be processed, you’ll see details of the transaction in the main transaction window.